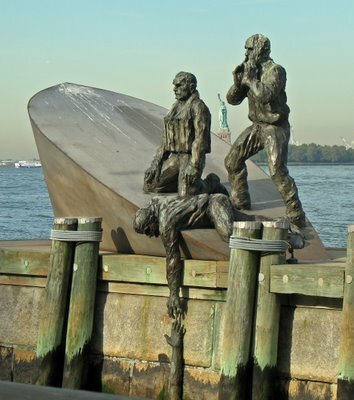 Self-Absorbed Boomer: The Merchant Marine Memorial. This memorial, by the sculptor Marisol, is positioned just off the northern end of the pedestrian promenade that extends around the seaward side of Battery Park, at the southern tip of Manhattan. It depicts three members of the crew of an American merchant vessel that has fallen victim to a German U-Boat, aboard what appears to be a partly sunken lifeboat, with one of them extending a hand to a shipmate who has fallen into the water. Some 9,300 U.S. merchant mariners are believed to have died in action in World War Two, a higher per capita death rate than for any of the uniformed services. Skidmore, Owings & Merrill retrospective. The best cut is the cheapest. A good day to fly a kite.